After a gap of several years, former Kurseong branch president of the Gorkha National Liberation Front (GNLF), IN Pradhan on Sunday addressed GNLF supporters as they marked 'citizenship day' at GDNS hall here. Like 2014, in 2015 too, the GNLF observed 23 August as the 'Gorkha Citizenship Day' at different places in the hills. Accordingly, a meeting was held at GDNS Hall in Kurseong, in which, the GNLF leadership spoke on 'citizenship day' and its importance for the hill communities. Besides several leaders speaking on 'the importance of the day' through different aspects, a new development was seen in which the former GNLF heavy weight leader, IN Pradhan, was seen addressing the gathering on the present political scenario of Darjeeling hills after remaining politically inactive for several years. 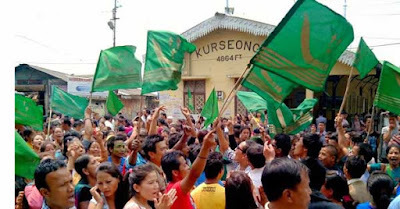 Pradhan said that after the issuance and publication of a gazette notification by the government on 23 August 1988, Gorkhas became complete citizens of the country. "Before that, the Gorkha people were looked with suspicion and there was a misconception regarding the Gorkha community. Hence, if anyone is saying that the Gorkhas had obtained 'citizenship' before 1988, they are foolish or we the GNLF are foolish or the government, who had issued such a notification is foolish," he added. Pradhan also criticized the GJMM led 2007 Gorkhaland agitation. He said that the GJMM led 2007 Gorkhaland agitation is merely a drama planned by sitting with the leadership in the plains. He said that the GJMM party is practicing their politics by pushing money, but they should understand that this won't last long. Talking about the Sixth Schedule demand, Pradhan said that the Sixth Schedule Bill had not been cancelled in the Parliament or in its standing committee, instead, the Bill was deferred in the parliament and its standing committee had suggested making some changes. It may be mentioned that after the advent of the GJMM party in 2007, its anti-GNLF activities had forced the GNLF leader and former DGHC councilor, IN Pradhan to resign from the party. Later, in November 2013, he had rejoined the party and addressed a meeting, however, since then, there has been no political activities from his side.